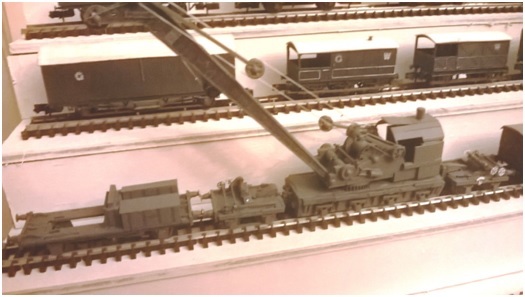 As some of you may know we have been developing a model kit of an N Scale Ransom and Rapier 45ton steam crane. 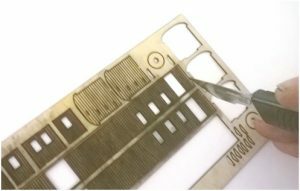 It is essentially done but we are trying to reduce the considerable number of parts and we intend to incorporate some 3D printing into the process but as development time on our printer is severely limited by our other activities, especially at this time of year, progress has slowed somewhat. However the crane is also going to need a mess and tool van to go with it. Sometime ago created the drawings for the laser with the intention of producing a mixed media kit incorporating Michael’s 3D printed American style GWR bogies so here is a brief description of the test build to make sure it all goes together properly to represent this particular van, (seen here with different bogies). Firstly here is a picture showing the laser cut wooden sides representing the planked type the kit is based on. Here I have already fixed the supporting bulkheads in place. Having glued the bulkheads I set them aside to set while I made a start with the chassis which is laser cut from plywood with card additions which when glued in position represents the bottom of the angle iron of the solebar and the footboards which are handed to match the doors but at this stage it does not matter which way round they are glued together so long as the cut outs line up for the bogie pins and wheel clearances. Lining these up will automatically put the rest of the piece in the correct position with equal overhangs. Best practice is to have a ‘dry’ run with each stage before gluing with PVA. Here is my best tip—- Squeeze a small quantity of glue at a time onto a piece of scrap plasticard or yoghurt type pot and apply the glue using a suitably sized paint brush. The next stage is to glue the floor with its upright supports to the chassis. 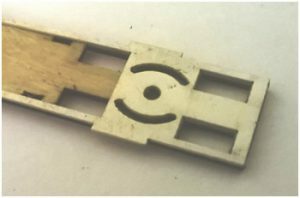 To do this properly, lay the chassis on a flat surface, (footboards down), and glue the floor in place using the bogie centre pin holes to line everything up squarely. Once this stage is properly set it is time to assemble the four sides and ends of the superstructure. Do this by removing all the parts required from the fret using a sharp knife to cut through the retaining ‘pips’. Any rough bits should be sanded smooth with an emery board, before assembly. The sides are best fixed in place without the inset door parts in position. Glue the first long side hard up against the stops on the partitions and ensure you have an equal overhang at each end to accommodate the end pieces. When the first side is correctly positioned add the second side in the same way. Only when the glue has set add the ends. These hang over the sides, (mimicking the stops on the partitions), and between the sides. Use a soft jawed clothes peg as a clamp if you prefer while the glue sets. Test fit the recessed doors as the smaller ones are different to avoid the windows. Now glue all the doors in place hard against the floor and equally within the gaps. Before adding the glazing, is the best time to paint and detail the body. Colours used for the outside were GWR coach brown and either cream inside or leave unpainted. Enamel or acrylics are equally OK but do thin them a bit. Also paint the solebars and underside of the chassis a suitable frame dirt colour, never neat matt black! The next stage is to paint the lettering using the paint masks supplied. No Transfers are required. Stick on the low tack self adhesive masks flush with the top of the body. These masks are handed so it is important to affix correctly. Also mask off everything else you don’t want over sprayed and when happy everything relevant is covered, lightly dust the paint mask with a sand/straw spray, either with an airbrush or a can of Humbrol acrylic sand colour. If you wish you can practice spraying on a piece of scrap. The masks can still be used again afterwards on the body. When the sprayed paint is completely dry peel away the masks and hey presto your body shell will look like this. Now is the time to add the details such as the trusses and the end steps. The trusses are glued into the slots provided on the underside of the chassis and the ends have slots already laser cut to take the card steps. Make sure they are at right angles to the ends. These are quite fiddly bits best applied with fine tweezers. There are 4 extras provided in case you lose any but cut them off the fret only one at a time! When all the steps have been added, (treads upwards), and the glue is set, paint them a frame dirt colour like the chassis. Glazing is provided pre cut to size so have a dry run to know which bits fit behind which windows and secure in place with PVA. Cut the roof from the fret above and very carefully, but gently, roll the card to the roof profile. Note the centre of the roof is fairly flat and the sides drop away sharply. You may find it best now to file down the ends and roof spacers, if necessary, where they meet the sides to obtain a smooth transition from roof to side when stuck down. Use an emery board to do this. Keep rolling the roof until you obtain a good fit with a dry run. Note the roof is ‘handed so if there are any upright spaces exposed by the cut outs turn the roof 180 degrees. When happy with the fit, glue and hold in place with low tack masking tape or utilise the ‘transfer’ masks. Meanwhile the roof lights have to be bent to shape. Again take care and bend along the perforated lines. When bent correctly add the glazing with PVA. Glue the roof light assemblies and the shell vents in place to complete the roof and paint. Here the dimensional problems with the roof lights show up so I will amend the drawing to make the corrections. Tiny holes are provided for handrails and I might try fitting some but it is not planned to add them to the kit components. Also at the moment we have not produced our own coach (or wagon) buffers so on this test build I have used some B&H Enterprises brass ones I had to hand, but they are not the correct type. The bogies are American Pattern GWR, 3D printed in house, with Bachmann/Farish Coach wheels fitted and here is the coach with buffers and bogies in place but no couplings although the bogies have provision for NEM couplings such as the Bachmann/Farish ones which will be provided in the kit as will the bogies and wheels. This picture shows the coach from a lower angle and it is clear I need to add the gas tanks etc. to the kit so I will amend the drawings to accommodate them for the final version of the kit. Reference to the original photograph shows the bogies inset more and the truss bars extending lower down so I will also incorporate that. This picture also shows the holes provided for handrail fitting. I will also try and provide the roof boards Laser etched with the legend “Loco Carriage and Wagon Dept.Swindon Factory”. So there it is, the first test build of the Tool Van, which has thrown up a list of a few improvements that will be incorporated in the kit. Apologies for the quality of the pictures taken in my dingy workshop! Wonderful ! Great start ! Will place my order as soon as I finish this comment. Sorry I will not be purchasing the Ransom & Rapier crane as I already have a Gem metal one to assemble, but good luck with that too.